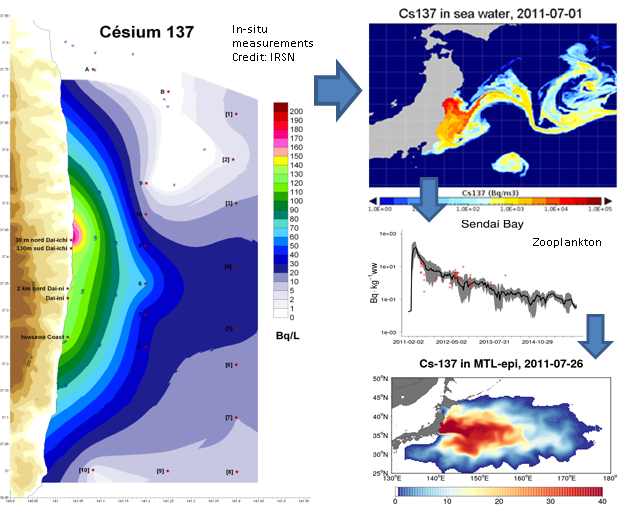 This French (ANR-Investissement d’Avenir) research project AMORAD (Improvement of radionuclides dispersion modeling and impact assessment in the environment) led by IRSN is studying the transfer of radionuclides in sediments and marine organisms as a result of catastrophic accidents (e.g., Fukushima). The mechanisms of transfer and accumulation of radioactive 137Cs in the marine food web are investigated and included in a new coupled SEAPODYM and radioecological model. An operational model will be then implemented to produce the maps of risk indicators that could be helpful in monitoring and sampling strategy development in case of radionuclide release in marine environment. Senina I., Lehodey P., Conchon A. (2016). Developing operational models to trace marine radioactive contamination of lower- and mid-trophic level organisms. Proceedings of the International Conference on Radioecological Concentration Processes, Seville, Spain, November, 6-9, 2016.